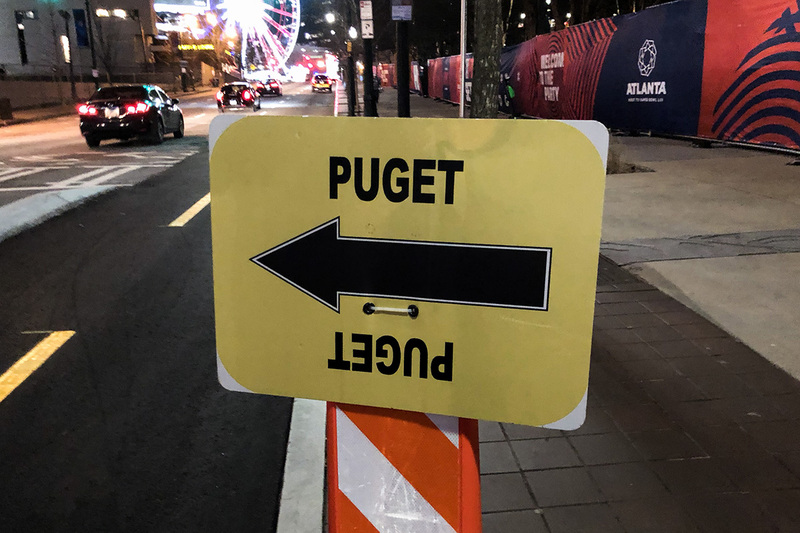 A Puget sign sits outside Centennial Olympic Park. January might be a slow month for film and television production here in Atlanta, but that doesn’t mean we don’t have a few things drawing in celebrities. (Well, besides Super Bowl LIII, that is.) Here’s a quick look at what we saw, where we saw it, and what each of those production codes you might see are for. The third film in the Bad Boys saga, Bad Boys for Life (production code: GFP), is currently filming in and around Atlanta. Still starring Will Smith and Martin Lawrence (and also Joe Pantoliano returning as Captain Conrad Howard), the film began production midway through the month. We spotted signs in Marietta between January 9 and 11. Between the 13th and the 14th, crews filmed in Buckhead, near Lenox Square. Additional signs were up in Hapeville on January 16. Crews were back in Buckhead on the 17th, and in Norcross on the 19th. From January 21 through 23, Bad Boys shot at a home on Lullwater Road not far from Emory University. January 29 took the production to Westview Cemetery, where artificial rain fell on cast and extras. Atlanta’s first project being produced for Disney’s new streaming service, Disney+, has begun filming this month. Noelle (WF), a Christmas movie starring Anna Kendrick as the titular Noelle, the daughter of Santa Claus. Also along for the ride is Bill Hader, Billy Eichner, Shirley MacLaine, and Julie Hagerty. We first spotted Noelle filming at Atlantic Station on January 15. After that, crews were working in Woodstock’s the Outlet Shoppes at Atlanta between January 18 and 23. They would remain in Woodstock, continuing to shoot until January 26. Most recently, on January 30, crews were spotted setting up in downtown Newnan. The Apple-produced reboot of Amazing Stories (PUGET) continued shooting into January. The anthology series placed signs off of Moreland Avenue near the Starlight Drive-In Theatre on January 12. Crews filmed near Emory’s Briarcliff campus on January 23. Most recently, production set up downtown, right in the shadow of Super Bowl LIII’s takeover of Centennial Olympic Park. Dolly Parton’s Heartstrings (BEULAH) was spotted in January as well. A basecamp was set up at the Tucker Recreation Center on Lavista Road between the 7th and the 9th. The following day, a scene was shot on Marietta Square. January 21 saw the production move back to Tucker. Also filming this month, Little (NEA), the sequel/reboot of 1980s classic Big, was spotted in Poncey-Highland on January 6 and in Piedmont Park the next day. BET’s Tales (TALES) filmed in Austell on January 24. AMC’s Lodge 49 (LODGE 49), renewed for a second season, worked out of Decatur between the 22nd and January 24. Signs were also spotted in the area on January 28. FOX’s Star (SOS) shot in Castleberry Hill on January 10 and downtown on January 25. Limited Partners (M&M) also had signs up downtown near Mercedes-Benz Stadium on the same day. The CW’s Dynasty (CROSS EYE) was in Norcross on the 10th, in Lawrenceville on January 15, and back in Norcross for most of the remaining month. Oprah’s Greenleaf (GL) also visited Norcross on January 19. The Gifted (HVN) was also spotted in Midtown on the 19th. The Resident (TR) shot downtown on January 14, in the Lindbergh area on January 18, and in Midtown on January 19. Doom Patrol (GRANT) filmed near Crescent Avenue in Midtown on January 9 and had signs up at the Moreland Avenue exit off of I-20 on January 19. Boomerang (PTV) signs were spotted off of Jimmy Carter Boulevard on December 31. Black Lightning (LOC / SIGN) was in Decatur on January 3, as well as between January 8 and 9. CBS’s MacGyver (EYE) filmed in Lithia Springs on January 7, 10, and 11. Lastly this month, we’re right in the middle of Hollywood’s award season, and Atlanta has done very well for itself. Seven productions—Black Panther, First Man, Dumplin’, Ozark, Atlanta, and Sharp Objects—were nominated for Golden Globes, and Patricia Clarkson took home the Best Supporting Actress in Television Globe for her work in Sharp Objects. On the Academy Award front, Black Panther led the pack of our nominees with seven nominations, including Best Picture, Original Score, Original Song, Sound Editing, Sound Mixing, Costume Design, and Production Design. The Neil Armstrong biopic First Man was nominated for four awards, and Avengers: Infinity War garnered a visual effects nomination. These films represent the best of the best produced in Georgia over the last year, so if you haven’t seen them yet, you might want to.